Moving the dial at a multi-faceted international multimedia company is no small feat. My team and I were tasked with prioritized feature updates to the Learn/Shop area of the Xfinity.com website. Projects included navigation testing, A/B testing, UX research, section re-architecture, feature updates, and new production process implementation. A unique aspect of my role as Creative Director included managing designers who worked remote every other week. When not on-site, they were stationed at their respective cities - Portland, Boston, Atlanta and New York. Onboarding onto the account, I found there was no component library the team was referencing. Without impacting the designers work, I created one and shared it with the team for future use. Embracing a user-centric approach with all of our efforts, I asked the designers to begin mapping a more narrative structure to the way in which content was presented to customers. We pushed for a more conversational approach to copywriting in all of our work. Overseeing UX testing was commonplace with both the Sapient/Razorfish team as well as Comcast's internal UX research team. Our team supported the facilitation of various UX research tests within Learn/Shop. 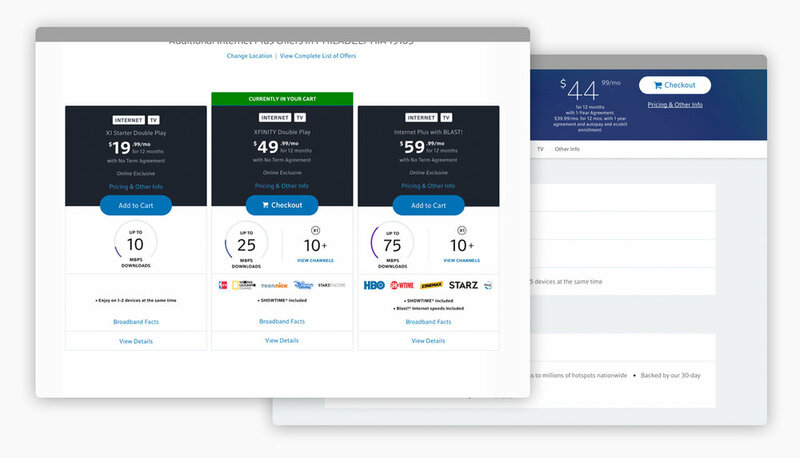 Above is a landing screen our team designed for an A/B comparison. In addition to helping define the parameters of the test, we designed the new landing screen for featured offers. This impacted a high traffic purchase flow for customers. A consistent high traffic area of the site is "All Offers". We continually tested various feature changes and eventually updated the design of the screen entirely. 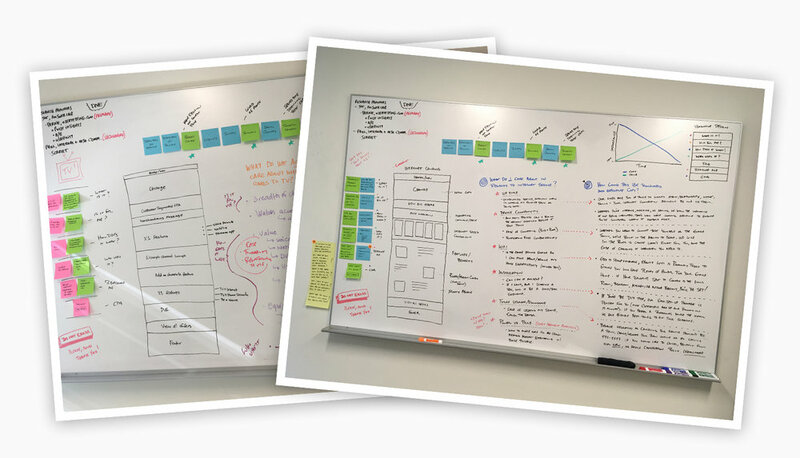 We leveraged several areas of user research to inform the changes made to the UX/UI. A prioritized effort from the product team was overall improvements around the existing cart experience. We successfully implemented a public facing protocol labeled internally as"saved cart". Phase one of "saved cart" was a specific indicator for users who selected an offer, left the checkout experience, then returned. If the user sees the same offer again once they return to the site, it's now apparent it was previously selected. We also helped the Comcast team strategize future additional phases of cart improvements. This included an empty cart state and an integration with buy-flow selections. Comcast is like a small city, so selling initiatives across all teams took time and patience. With every push, I assembled a presentation deck to help communicate our intentions and efforts.